Canvas tote bag printed with one of Jack Vettriano's famous paintings. Image -Anniversary Waltz by Jack Vettriano. Fantastic quality tote bags by Von Lilienfeld with two strap handles for carrying by your side or your shoulders. Has a zip fastening top with two pockets on the inside and two at the back (without zips). There is also a pocket on the pack with a zip which is an ideal size for a mobile phone. 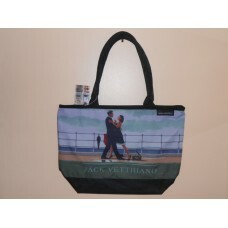 It has a spacious interior and is an ideal size and style to carry beach wear or to use as a handbag. Two inner pockets, one on each side; these do not have zips. Two pockets on the outside at the back, without zips. One zip pocket on the outside at the back, on one of the outside pockets; ideal size for a mobile phone.